CorpNet Foreign Qualification Review Is It A Good Service For You? Do you want to form a new company, but you’d rather open for business in a different state? Or perhaps you’re looking to expand an existing company into a new market? There are many good reasons that entrepreneurs seek foreign qualification, and companies like CorpNet specialize in helping you quickly obtain your Certificate of Authority. To complement your own research, my team and I invested countless hours into researching the details of every major foreign qualification service. Our goal is to give you the information you need in a convenient format, to help you make the best choice for your business. In this CorpNet foreign qualification service review, you’ll find an in-depth breakdown of their most significant pros and cons, along with pricing, features, customer reviews and much more. Let’s find out if they’re a good fit for you. Any service purchased from CorpNet is covered by their 100% satisfaction guarantee. If you’re less than entirely satisfied for any reason, they’ll refund the fees you paid to CorpNet, no questions asked. It’s nice to know they’re so confident in what they provide. Based on customer feedback, it doesn’t seem like they get many requests for refunds. Even with hundreds of reviews available online, CorpNet maintains excellent average rating scores. Criticism is in short supply among CorpNet’s clients, as over 99% of their reviews are positive. CorpNet is a complete foreign qualification provider. They even take care of state-specific compliance requirements where necessary, like publishing proof of your qualification in a newspaper, which many of their competitors leave for you to handle on your own. They provide registered agent at no extra charge to every foreign qualification customer. Considering CorpNet normally charges $149 for registered agent as a stand-alone purchase, it’s a great bargain. 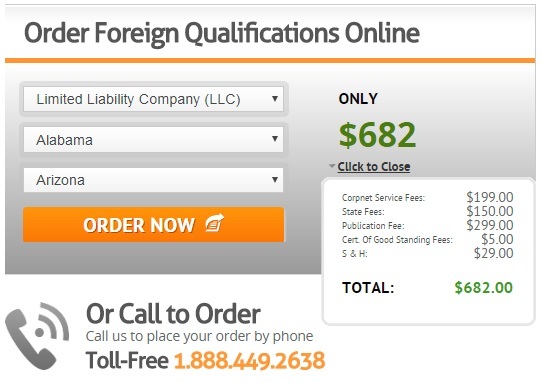 While their $199 price point for foreign qualification service is essentially the industry standard rate, there are more affordable ways to get your foreign qualification. For example, IncFile only charges $149. CorpNet charges a flat rate of $228 (plus state fee) for foreign qualification service. One thing I appreciate is how they handle every possible step that it takes to acquire your Certificate of Authority, and they also do a great job of explaining where your money goes. Take a look at this estimate for Arizona, which is one of the states with the most demanding compliance requirements. CorpNet makes foreign qualification obtainment as easy as possible for entrepreneurs. In most cases, all you’re required to do is provide them with your company’s basic information, like the nature of business you conduct or your physical address. After that, you can sit back and relax as CorpNet takes care of every step of your foreign qualification. Unlike many competitors, they even handle your state-specific compliance requirements, saving you time, money, and most of all hassle. I managed to find over 300 reviews written by CorpNet customers, and just 3 of them are critical in nature. Over 99% of their feedback is positive. Their clients seem to enjoy how quickly CorpNet works, as well as how helpful their support staff is. Conclusion: With an impressive quantity of reviews, and excellent quality as well, it would be difficult to find any fault with CorpNet’s fantastic customer feedback. I’ve spent a good deal of time going over the details of foreign qualification service offerings, from providers big and small. Throughout the course of my research, I’ve noticed that some of them seem like better deals than others do. On the other hand, I’m not here to tell you about my personal favorite provider, I’m here to help you figure out if CorpNet is the right call for your company. CorpNet is a great choice to obtain your foreign qualification, but they’re far from the only option in this industry. Let’s take a quick look at IncFile, one of their top competitors, to see how they compare. Pricing: IncFile’s $149 price point (plus state fee) is considerably less expensive than CorpNet’s $228 rate (after shipping/handling). Features: These two companies have similar offers for foreign qualifications, except for state-specific compliance requirements. I mentioned earlier that most of CorpNet’s competitors don’t handle every possible step, and that’s true for IncFile, as for example they don’t offer publication service. Only a handful of states require publication, but if your state does, it’s nice to know CorpNet will handle it. Customer Support: CorpNet and IncFile both have knowledgeable and friendly customer service representatives. Neither company offers the highly customized support that some competitors offer, like Harbor Compliance for example, but CorpNet and IncFile still do a fine job. One minor difference is that IncFile can take a while to get back to you on occasion, as I’ve personally waited 24+ hours to get a response. Experience: These two providers have similar levels of experience. CorpNet’s ownership group started offering business services in 1997, and they’ve helped 100,000+ businesses since then. IncFile opened in 2004, and they’ve served over 150,000 clients in that time. Can I File My Own Foreign Qualification? You do have that option, but we don’t recommend it unless you’re already familiar with the process. The DIY option is even more complex than it is for some other business filings, simply because it varies so much by state, and there is no one-size-fits-all process for doing it. As I mentioned earlier, they have a 100% satisfaction guarantee. If you’re unhappy for any reason, simply ask for a refund and they will pay back any fees you paid to CorpNet. CorpNet protects their website with the Norton Shopping Guarantee. This feature provides $10k in identity theft protection, $1,000 in purchase guarantees, and a lowest price guarantee that pays you the difference if CorpNet lowers their prices in the future. Does CorpNet Offer Ongoing Support? Absolutely! CorpNet takes pride in their ability to assist you, whether you ordered your foreign qualification today or months ago. CorpNet gets a score of 4.5/5 in my opinion. They have fantastic customer feedback, and they handle every possible step necessary to obtain your foreign qualification. Whether you’re ready to get started with CorpNet, or you would like to review some more options for foreign qualification service, simply use the buttons below.